1. Preheat the oven to 220°C, gas mark 7; put a large baking sheet in the centre of the oven. Put the strawberries, 90g sugar and the strip of zest in a medium pan. Set over a low-medium heat, stirring often, until the mixture begins to bubble and the sugar dissolves. Turn the heat up a little; simmer briskly for 3-5 minutes, until syrupy. Stir in the lemon juice and remove from the heat. Set aside until ready to serve. 2. Sift the flour into a bowl. Stir in the salt, almonds, 15g sugar and the grated lemon zest. Rub in the diced butter until the mixture resembles soft sand. Use a blunt knife to quickly mix in 120ml milk, bringing it all together with cool hands once a shaggy dough forms. (Add the extra 10ml milk, if needed, to form a dough that is soft but not sticky.) Tip onto a lightly floured surface and knead briefly until uniform. Bring together into a disc and roll out to about 4cm thick. Flour a 6-7cm cookie cutter and stamp out 6 rounds, gently reshaping and re-rolling the dough as needed. 3. 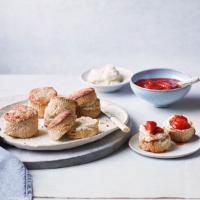 Brush the scones with milk, scatter with the remaining 15g caster sugar and swiftly transfer to the hot baking sheet. Bake for 10-12 minutes, until golden and risen. Cool on a wire rack, then serve with the clotted cream and compote.